It's the middle of November and we've been enjoying gorgeous weather up here in Saskatchewan. For whatever the reason, I seem to have been in the the right place to catch livestock movement in the past few weeks. 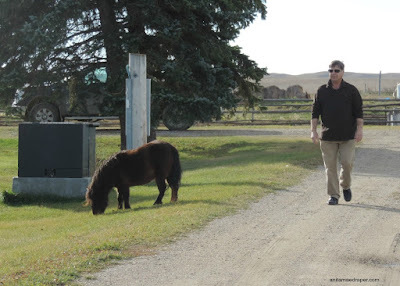 The last week of Oct started off with a nice encounter with a mini-horse. We stopped off at a friend's farm to drop something off on our way to Regina and found the driveway blocked by a closed gate because their mini horse was running loose in the yard. Nelson walked up to the house while I took photos from our car. And yes, we made sure the gate was closed when we drove away. 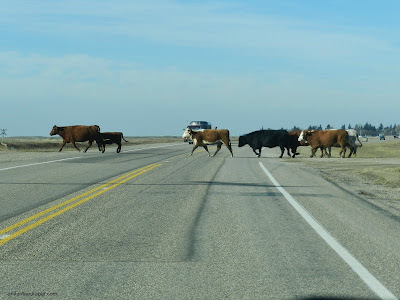 A couple days later we were on our way to the Circle Square Ranch to drop our son off for work and we found these cows standing on the side of the road. 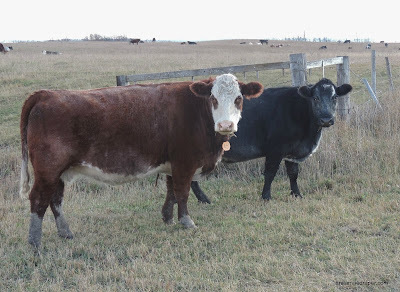 They're nice cows and all, but they should have been on the OTHER side of the fence. 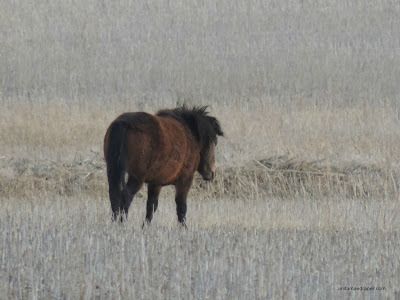 The next day, I looked out my kitchen window and saw a bay pony trotting down the road heading south. All alone, it kept its head down and speed even as if it was on a mission. I didn't recognize it, so put out a notice on the local Facebook page. Soon after, I was relieved to see a truck heading down the road after it. 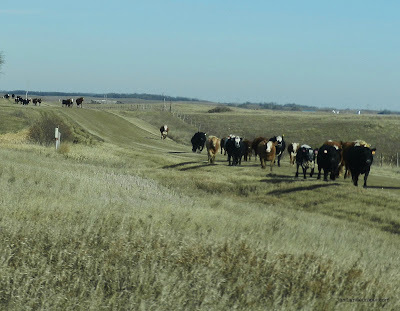 On November 7th, we were on our way to Regina when we had to stop for a cattle drive. It was quite unique as the cattle came down a dirt road from the north, crossed the highway, and continued travelling south. On either side of the crossing sat a truck and cattle trailer with the drovers and quads on standby if needed. Finally, here's a video I took on Sunday about cowboys checking for strays during the fall round up. If you can't see the video, please let me know. I unlisted it on my YouTube channel because it came out so blurry... when I watch it full screen on my computer, I can see the cowboy's mustache. But when it uploads on YouTube, I can barely see his face. Frustrating. And wouldn't you know it...the forecast is for a deep drop in temperatures over the next few days, high winds, and the possibility of driving snow. I would groan about it, but since I can't complain about the weather we had in October, nor November thus far, I'll just recharge my camera batteries, stock our fridge, and wait for whatever comes. I mean, we want a white Christmas after all, and we need the cold weather and clouds for that. 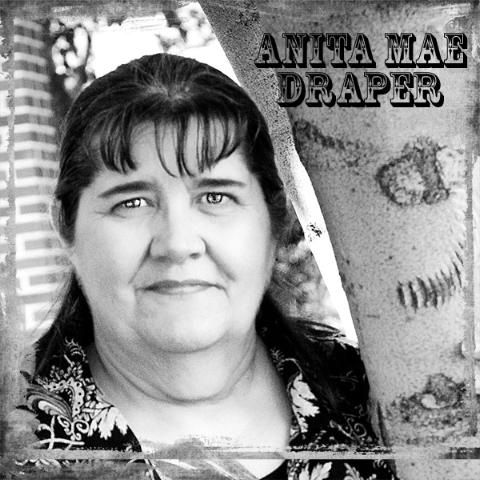 Now, how about you... any cattle drives or loose livestock running around where you live? Its a snowy windy day here in my part of Saskatchewan! But not too cold - yet!! HI Elaine. I know what you mean about going to get the cows. My grandparents had bush in one corner of the pasture and you can be sure that's where the cows hid during the hot summer days. Sometimes they'd come when we called, "Soo-ee" (sp?) and that was fun watching them trot across the pasture. Weather here is awful too, especially after the gorgeous day yesterday. At this moment it's overcast with darker clouds in the west and snow forecasted. The house is being buffeted by high winds, and the trees in the yard are disco dancing with their limbs going in every direction. It rained last night so the roads are yuck. Temp sitting at freezing point as if trying to decide which way to go. Hello, Winter! Actually, yes! My new daughter-in-law posted pics yesterday of the cattle running down Main Street in Carbondale, Colorado, outside the beauty salon where she works. And hubby and I drove through a flock of sheep on the way to church a couple weeks back. We call them "Western Colorado traffic jams" and far prefer them to the traffic they have over on the Eastern Slope. Niki, 12F is -11C and that goes along with the forecast that we'll be getting "minus temps in the double digits". ugh - but -11 isn't as bad as -20. We shall see. That's funny! We're more likely to see sheep than cows here, but that might just be our particular location. And if you ever want to see a sheepdog demonstration, Meeker (our old town) hosts the world famous Meeker Classic Sheepdog Championship Trials every September. Those dogs are AMAZING. Wait, so the cattle are heading south? For the winter? Who knew? I thought it was only birds that did that. Seriously, we don't have much in the way of livestock raising in this area. Most of the big farms grow crops -- wheat (in the winter), corn and soybeans (summer), and then a county or two to our west add peanuts and cotton. We get to see some really big tractors on our roads this time of year as they move from field to field. CJ, I hear you on the big tractors, except now that the ground is freezing, the only ones on the road are the ones hauling round hay bales. But that was Zone 5 gardening and we were on the same latitude as Northern California. Out here on the prairies, I'm Zone 2. (sigh) I don't garden much anymore. I must admit at this point that in Ontario we lived across the road from a Morgan horse farm with a 2 mile track. Every day, drivers would train the horses for harness racing. But to me, that was a horse farm, whereas in the west, horses mean ranches and cowboys. Big difference to me. Our mares don't foal here until May/June due to the cold and lack of available green pasture.